In the past month, three devastating earthquakes hit the southern part of Mexico and killed an estimate of 320 people. The earthquakes have changed many lives and families and destroyed many buildings. Back in 1985 there was a deadly earthquake that killed approximately 9,500 citizens. It destroyed buildings the size of the old A Loft tower in Downtown Asheville. Mexico has a bad history with deadly earthquakes. 8.1 Earthquakes strike Chiapas Mexico! On September 9th 2017 at approximately 11:59 PM the first earthquake was to hit Southern Mexico offshore Chiapas, Mexico. This earthquake was Monstrous and could be felt 600 miles away from the epicenter! It was so strong it caused a mini Tsunami with waves up to 10 feet! The coastal town of Puerto Madero had to evacuate Because of the Tsunami. During this horrific incident, 400 houses were destroyed and 1,400 were damaged. Another devastating Earthquake strikes Mexico in Puebla, with magnitude being 7.1! Almost one week later, on September 19, at 2:14PM another quake struck 75 miles away, southeast of Mexico City. This earthquake may have not been as strong but it did kill 230 people, including 20 school kids. Everyone in the hispanic community is helping out including Teacher, Parents, Firefighters, Carpenters etc… Every once and awhile people would yell for silence to hear the children or people scream or talk for help. People were still combing the debris and rocks for any survivors long after the quake. Then, one week after the second earthquake, a 3rd one hits with magnitude being 6.1 and 10 km in depth. 10 is small compared to the 2 other earthquakes, but it is closer to buildings and citizens of Mexico. Scientists say this was a aftershock of the earlier 2 earthquakes but don't know which one it was from. This earthquake has delayed rescues in Puebla for rescuing survivors. Why are there so many hurricanes this season? people and caused catastrophic flooding and damage in southeast Texas and Louisiana. Many say that Hurricane Irma was a Category 6 Storm, but this isn't true! There is no such thing. hurricane season is still to come. What is causing these large hurricanes? Julian Heming, the Met Office's tropical prediction scientist, told The Telegraph about the reasons Irma is such a large hurricane. The wind shear (change in wind with height) is low, meaning air can flow in up and out of the hurricane very efficiently, thus promoting intensification. There are no drying influences at present, such as pockets of Saharan dust which sometimes drift out over the Atlantic. feed of warm, moist air into the hurricane. According to Wayne Drash from CNN 10, global warming is making hurricanes bigger and stronger, which makes sense to me! I hoped you liked my story, thank you for reading and have a good day! Kiribati is one country that has a good chance of disappearing due to climate change and major floods. This is an archipelago which consists of 32 atolls and one island. On average, this island is 3 meters above sea level which is not a lot. The president of Kiribati has already bought land on the largest island in Fiji. Due to a mixture of climate change and cyclones, the Kiribati archipelago is going to face extreme challenges. Tuvalu boy hangs out around a tree nearly underwater. A second island nation whose future is well, no future, is the tiny island nation of Tuvalu. Tuvalu is the fourth smallest nation in the world and only with a population of around 11,000 its highest point is only 15 feet above sea level. And with climate change making sea levels rise the future of Tuvalu is not bright. Cyclones and tropical storms have been getting much much worse since the late 1980’s. Also about 10 feet of beachfront have disappeared in the past decade. Tuvalu is a tiny island with much culture that has a good chance of sinking into the ocean. These are 2 people standing in some wreckage most likely from a cyclone. 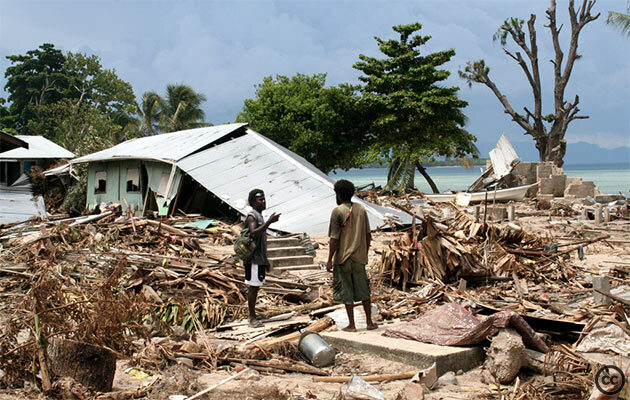 The Solomon Islands are not looking much better because already 5 of the more western islands have sunk into the ocean, one of which was inhabited with 20 families. More so, 6 other islands have already lost 20% of their land area. The Solomon islands are some islands with beautiful landscapes which some of which have already sunk into the ocean. This is an aerial picture of the highest point in The Maldives, Addu Atoll which as you can see is not extremely high. The Maldives are a beautiful island paradise which at most lays 1/2 a meter above the water also The Maldives are the only country on this list not in the continent of Oceania. They are south of India. There are actually roads that are only a few inches above sea level, and a hospital in the nation regularly floods. There has been beach erosion as a result of human civilization for the past 3 decades. These are all countries with beautiful landscapes that soon will disappear. There are hundreds of thousands of people living in these countries. If you ever get the chance to go to any of these countries take it, because these paradises are fantastic and will soon become only a distant memory.